I’ve been messing around with buttermilk biscuits. As with so many good things that come from the kitchen, these musings started with butter. For those of you who have The Book, I detail a method for making butter. It’s a ridiculously easy thing, particularly with a stand mixer. I’ve written about making butter here, my friend Carol wrote about it, and I even did a podcast once. I wrote a recipe for this month’s AllRecipes Magazine, too. Making butter led, ultimately, to making biscuits. I realize there is a world of biscuit-making talk from the likes of Nathalie Dupree & Cynthia Graubert, Virginia Willis, and Sheri Castle. I love these women with all my heart and hope they know how much I respect them. Yet, here I go. Me. 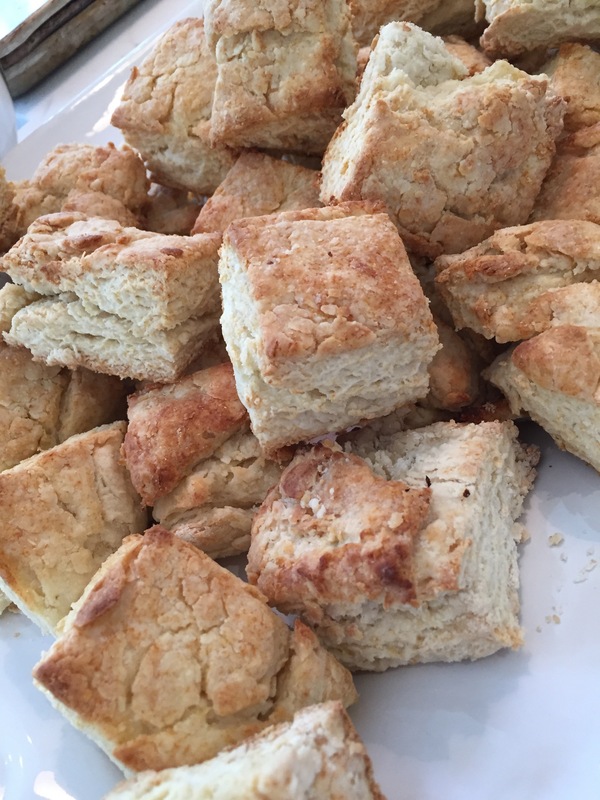 A Yankee-born, Washington DC-living, cook about to declare I have my own method, my version, my very own path to this Southern staple the buttermilk biscuit. It’s kind of crazy. But these biscuits I’ve made are just that good. I’ve tinkered, I’ve tested, I’ve tasted. I’m clear on the recipe that works for me. Appearing in both of Miss Lewis’ marvelous books, The Taste of Country Cooking and The Gift of Southern Cooking (written with her long time friend Scott Peacock), the recipe is compact. There are only five ingredients: Butter. Buttermilk. Flour, Baking Powder, Salt. 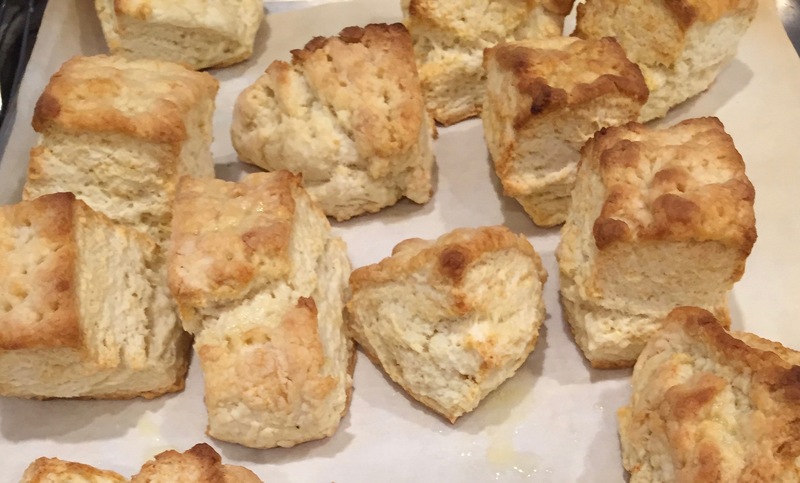 My biscuit meditations began when I realized one pint of cream produced butter and buttermilk in perfect proportions for one batch of biscuits. And with a little flour blending, the results were spectacular. Every. Single. Time. 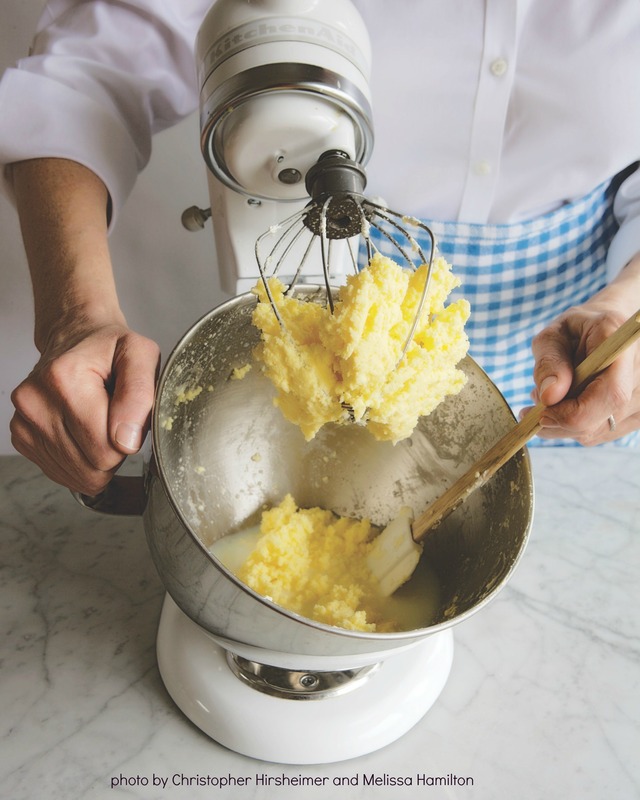 Once the butter was churned (in the stand mixer), there was no need for a single piece of equipment beyond the hands on the ends of my arms. 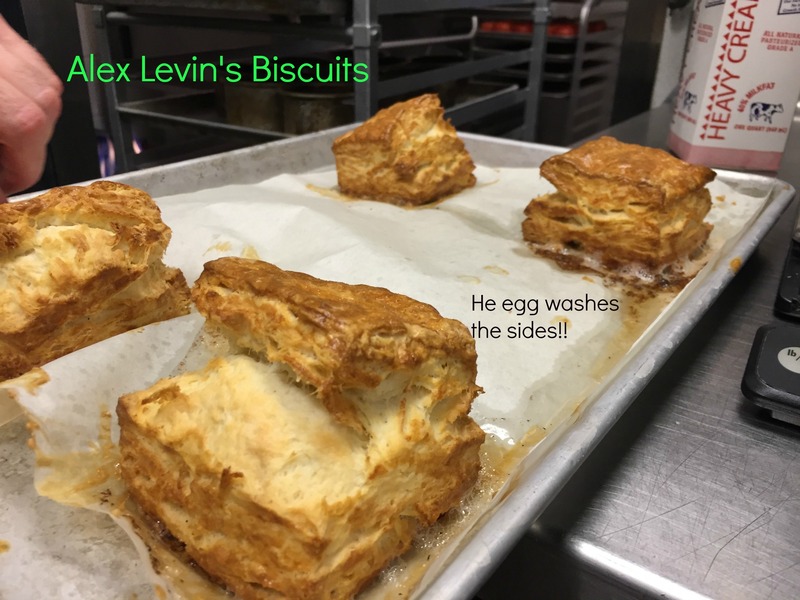 This is what made the recipe even more compelling; the idea that I might be making biscuits in a way consistent with the easy ways of Miss Lewis’ people. There was a time when the cream that rose to the top of fresh cow’s milk was skimmed and churned. Add the resulting butter and buttermilk to flour and baking powder with a generous pinch of salt, and these simple ingredients convert to flaky, high rising, golden brown beauties. When hot biscuits emerge from the oven there is just nothing better. I’ve talked plenty about the butter and the buttermilk, and while you can most certainly make these with store-bought butter and buttermilk, there’s something magical about transforming a pint of cream into fat, hot, flaky biscuits. Make butter first. Store the buttermilk in the fridge and the butter, formed into a ball or block, in the freezer. Flour is a big subject. One I am only starting to understand. I spent a day with Alex Levin, Executive Pastry Chef at DC’s scrumptious Osteria Morini. He’s got a seriously brainiac attraction to pastry, breaks recipes down by the number into ratios and proportions and can talk flours all day long. 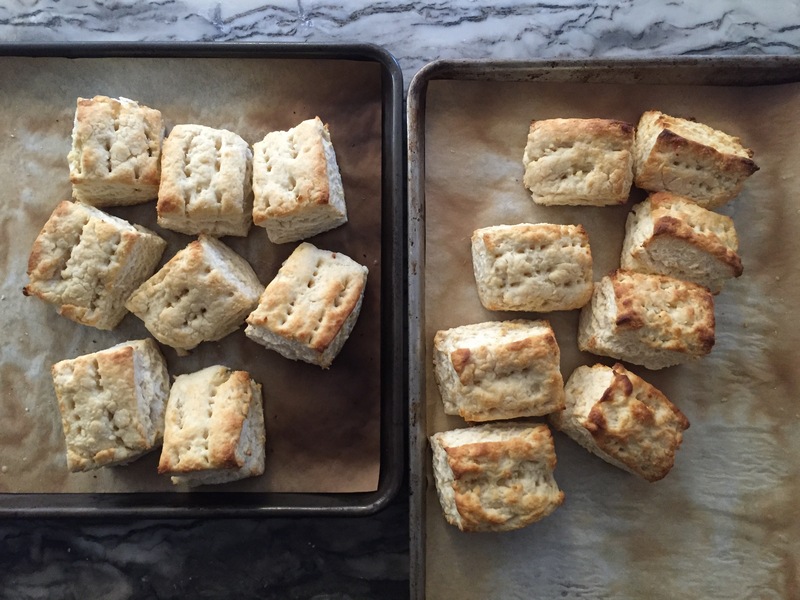 Our approach to biscuits is completely different and it’s easy to see they look different, too. I adore Alex’ biscuit. It’s a little sweet, a little salty, it’s crackly and shiny on the top AND the sides (he brushes egg wash on the top and the sides which is so damn counterintuitive I was tempted to scold him). BUT IT WORKS. Everything he does is crazy if you know anything about Southern biscuit making but damn if his biscuit isn’t tasty. Just imagine. He beats the butter and flour in the mixer until it makes a cohesive dough, folds it like it’s a laminated dough, and —this is where my mind was blown —even blends his own flour mixture. Over the year of biscuit meditations, I’ve baked with King Arthur All Purpose and with White Lily All Purpose. I prefer White Lily but it’s impossible to find locally, so my biggest take away from Alex’s method was the idea of mixing my own soft flour. My most recent batch of biscuits was ethereal. I used 2/3 King Arthur All Purpose flour and 1/3 King Arthur Pastry Flour. For the record, I’m not a fan of self-rising flour, so I don’t subscribe to that particular ingredient in biscuits. I do make fresh Baking Powder mixing 2 parts Cream of Tartar and 1 part Baking Soda. 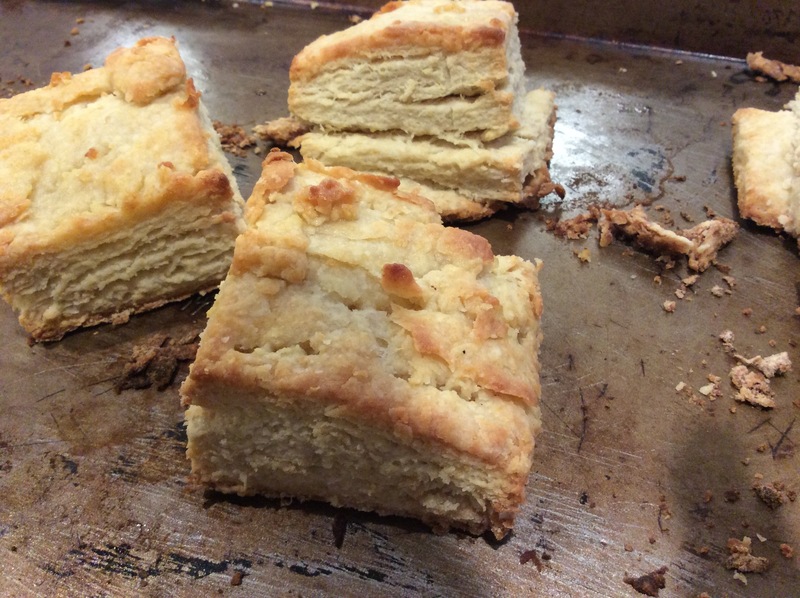 A fresh batch of baking powder is a boost of confidence for buttermilk biscuits. 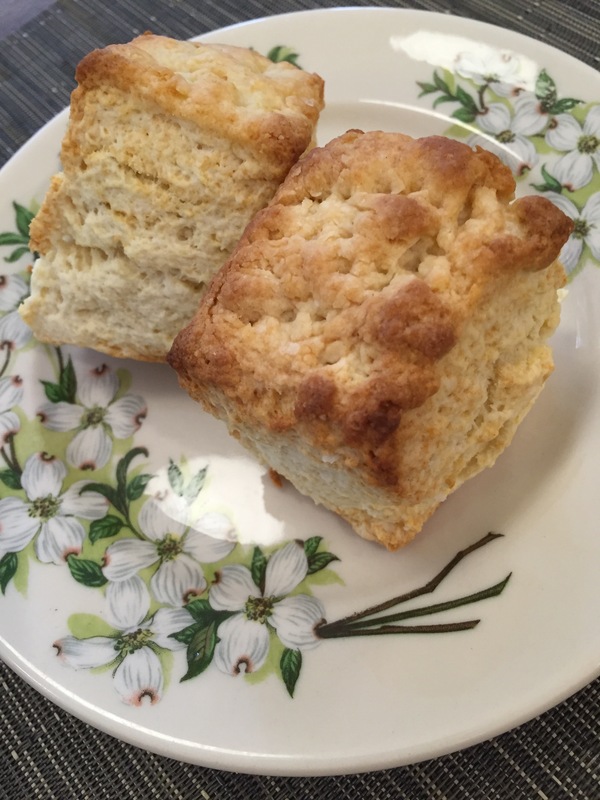 I’ve seen many ways to incorporate cold butter into flour on the way to the perfect biscuit. I’m partial to my box grater and butter that’s frozen solid. Gently mix the fallen petals of butter into the dry ingredients and each one is individually coated, prepared to rise up in the oven making layers of buttery goodness. Biscuit cutters are fine, but I always make square biscuits because I can’t bear to waste dough and biscuit dough doesn’t re-roll, no matter what anyone says. Make them small or large, anywhere from 15 to 30 from this recipe. If you must have round biscuits, use a sharp cutter and do not twist it, but push the cutter down into the dough with force, lift up straightaway and plop the biscuit on the baking sheet. Miss Lewis docks the biscuits “right through” before baking, pressing the sharp tines of a fork through all the collected layers of dough. Most of the time I dock, too. Miss Lewis brushes the tops of the biscuits with melted butter as soon as they emerge from the oven, and I believe this to be a very good idea. Making biscuits is easy to do. Make the butter and buttermilk in the evening, as dinner is cooking. Make the biscuits in the morning. By the time the oven is hot, they’ll be ready to go in. Or the other way ’round, so those biscuits are ready for dinner. Make sure to enjoy these biscuits right out of the oven. Heaven. Heat oven to 500. Line a baking sheet with parchment paper. Have a bench scraper close at hand.Generously dust the counter. Work quickly. In a very large bowl, whisk the two flours, baking powder and salt. Using the largest holes on a box grater, grate the frozen butter over the dry ingredients. With your hands, mix the butter through the dry ingredients. Add the buttermilk all at once and, using your hands, mix the biscuit dough until it just holds together. Dump the dough on the floured counter. Press it out to an 8-inch square, and, using the bench scraper, lift the top half of the dough and fold it over the bottom. Turn the dough 90 degrees. Gently press out the dough with the rolling pin to a square 9-inch by 9-inch. Lift the top half of the dough and fold, then turn the dough 90 degrees. Repeat 2 or 3 times. Using a long-tined fork, dock the dough all over (pierce through to the countertop). Using the bench scraper, making swift, sure cuts through the dough, cut square biscuits in the size that works for you. Lift the biscuits and place on the lined baking sheet. Slide into the oven and bake for anywhere from 8 to 12 minutes, depending on the size. Let them get good and brown. As soon as the biscuits come out of the oven, generously butter the tops with the melted butter. Now, have one. Oh, Cathy. Oh, oh, Cathy. I am in awe, jealous awe, of your biscuit skillz. I can’t wait to try this!! Miss Edna Lewis and Mrs. Wheelbarrow, in the same paragraph with biscuits and butter. Sigh. Heaven. Kinda lost you when you said to lift the dough and turn it 90 degrees. Do you mean lift it and fold it over, THEN turn 90 degrees? Should the final dough be 9×9 when you cut it? I’m eager, but appreciate precise direction. Yes, fold it over then make that 90 degree turn. Yes, the final dough is 9×9 or thereabouts when cut. Thanks for all of the information. Makes me want to run out for cream, or get on down to DC as soon as I can! These biscuits sound heavenly! I may have to succumb. Being SOUTHERN born and raised, I simply cannot abide by mile high, fork pricked, square biscuits ! So sorry all you Yankee bakers, it just is not a biscuit when it looks like layers of filo dough. I usually love your recipes, Mrs Wheelbarrow, but this time I will stick with my grandmother´s and her grandmother before her, cut with a glass or an old metal biscuit cutter, kneaded a couple of times gently with the heel of the hand, folded over ONE time and cut in rounds, no egg wash, no melted butter, just beautiful & golden out of the oven to butter or honey or syrup at your pleasure. Butter & buttermilk yes! Gold medal flour works well. Keep it simple and old time delicious! I hear you, Eileen, and I knew I would hear from some of you. Please don’t hate me. We can agree to disagree, right? This entire piece is glorious. 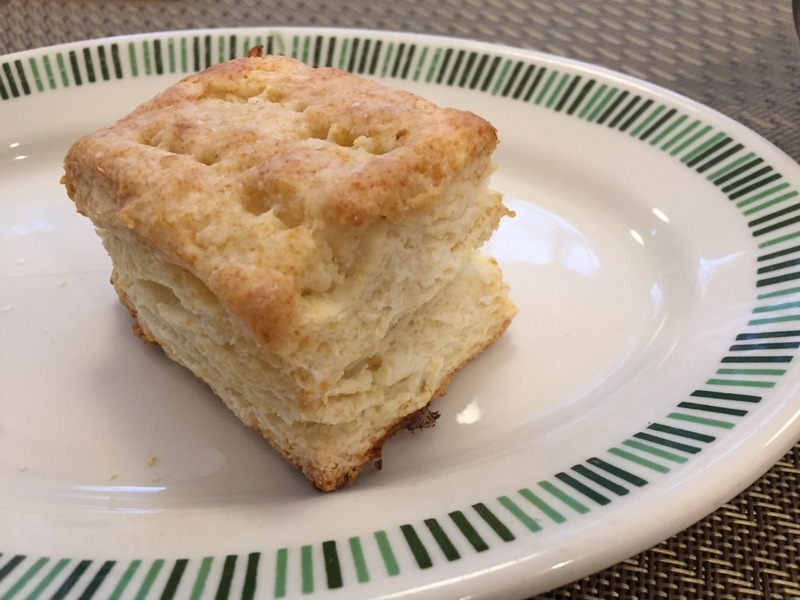 I’m familiar with the Southern style of biscuits, which were what my Midwestern mother made. I know she would approve of your fresh butter, since butter was probably her favorite foodstuff. I’m more an appreciator of baking than a baker, but these are so beautiful, I’m inspired to try to make them. I just made a batch (including the homemade butter) and they’re just what I’ve been hankering after! One question, though – is that 1 TBS of salt correct? They taste too salty to me, but it could be my palate acting up. I’ll be making these again…and again…and again. Dear Whitney, I’m so sorry to be late in answering this. That is the right salt measurement but if it’s too salty for you, cut back to 2 teaspoons. There is no science in the salt! Love your post! I would have loved to see your trials leading up to this too. Who’s recipes and methods did you try along the way?